This can be subtly triggered through conversations, or other interactions with peers and colleagues. Social identity threat can be experienced when taking a challenging academic test, and results in poor performance on the test (known as stereotype threat3,4). Why Does This Matter for STEM Professions? Actively addressing subtle behaviours that trigger social identity threat are critical steps in creating inclusive and safe workplaces, and retaining more women in STEM fields. This can be done through raising awareness about social identity threat, and creating spaces that welcome all identities. Gender inclusive policies can result in all employees feeling more accepted and competent in daily conversations, and more engaged in their work. 1. Hall, W., Schmader, T., & Croft, E. (2015). Engineering exchanges: Daily social identity threat predicts burnout among female engineers. Social Psychology and Personality Science, 6(5), 528-534. 2. Steele, C., Spencer, S., & Aronson, J. (2002). 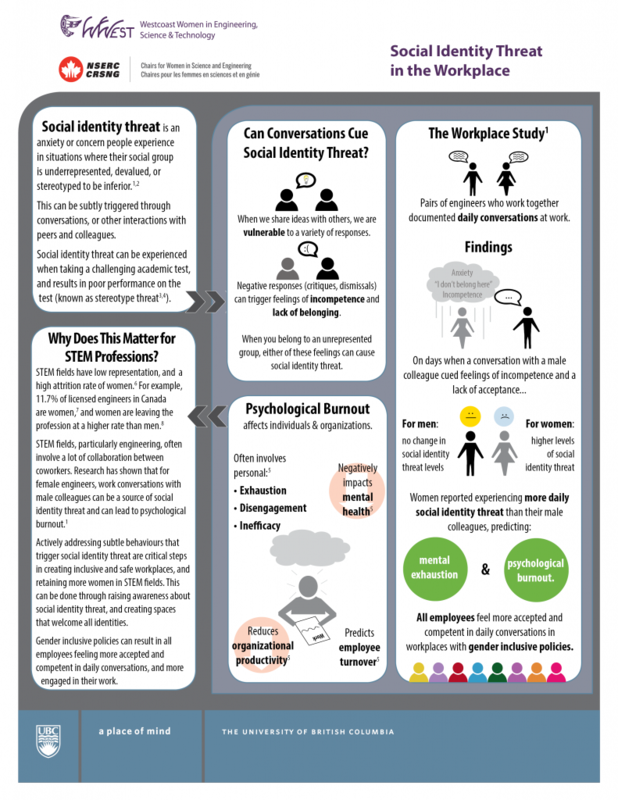 Contending with group image: The psychology of stereotype and social identity threat. Advances in Experimental Social Psychology, 34, 379–440. 3. Schmader, T., Johns, M., & Forbes, C. (2008). An integrated process model of stereotype threat effects on performance. Psychological Review, 115, 336–356. 4. Steele, C. M. (1999, August). Thin ice: Stereotype threat and black college students. The Atlantic Monthly, 28, 44–47, 50–54. 5. Maslach, C., Schaufeli, W. B., & Leiter, M. P. (2001). Job burnout. Annual Review of Psychology, 52, 397–422. 6. Hill, C., Corbett, C., & St. Rose, A. (2013). Why so few? : Women in science, technology, engineering and mathematics. Washington, DC: AAUW. 8. Hunt, J. (2010). Why do women leave science and engineering? (NBER Working paper 15853). Cambridge, MA: National Bureau of Economic Research.